The term "shock" is used to describe matter subjected to force with respect to time, while an impact is an extreme force or shock applied over a short period of time. The effects of either can be damaging to an object or a single element of that object. However, with the help of a viscoelastic material, which exhibits both liquid and solid characteristics when under load, the impact can be absorbed. Sorbothane® can decelerate parts and reduce peak forces with impact absorption up to 80% at proper dynamic deflections. 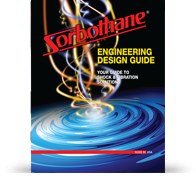 Learn more about Sorbothane® and its ability to attenuate shock.